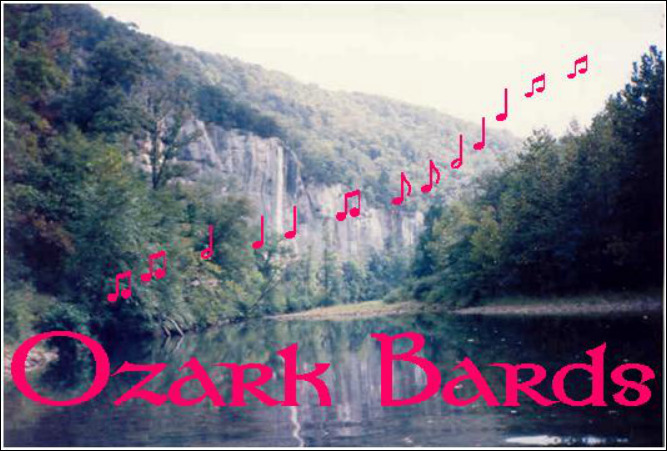 Welcome to the Ozark Bards site! Our band members are Dwayne and Barbara Smith and we are wandering Ozark musicians/storytellers. We love to share the wonderful songs and stories that were sung and told by people in our Ozarks region in the 1800s and early 1900s. Dwayne plays banjo, guitar, mandolin, spoons, washboard and almost anything that makes noise. Barbara plays accordion, dulcimer, autoharp, soprano and alto recorders and tells stories. We take elements from old time, bluegrass, and even classical styles to create a new style that we call "calico grass." In true folk tradition, we adapt and arrange folk material for clarity and aesthetic satisfaction. Whether you like funny old mountain songs, ballads, songs from Scotland and Ireland, gospel songs and spirituals or all of the above, we sing them. Fast, slow, funny, sad, rowdy, beautiful or reverent--we sing it. We're kind of like the weather in this region--if you don't like what we're doing now, wait a little while and you'll get a big change! To schedule the Ozark Bards for a program, call Barbara Smith at 417-623-3914 or email us at dbsmith1@cableone.net. The Ozark Bards live in Joplin, Missouri and have performed professionally since 1996. We both grew up in the Arkansas Ozarks and have heard and sung the old songs of the area since we were children. We have played at historical societies, libraries, schools, senior centers, reunions, cafes, churches and festivals, including the Festival of American Music and Craftsmanship at Silver Dollar City. We also played for several years at the Ozark Folk Center State Park in Mountain View, AR. Dwayne & Barbara Smith are current members of the Missouri Folklore Society.